It grows decently well when grown with roots in water and leaves above. I have one in a bowl at home as well. A 4 gallon tank is big enough for a moneyplant and a betta... Why do you think it will be crowded? Money plant or "phothos" is a house plant, it is not a aquarium plant. However it can survive in aquarium if it has just its roots in water and allowed to grow out. Fully submerged, it dies off after some time. It gets to be a pretty large plant and will corner most of the space in an bowl or small aquarium. 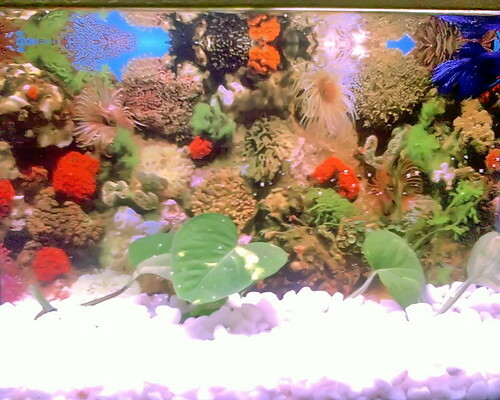 Even if betta is a small fish and needs less space I don't think it is appropiate to keep it with money plant. Well, my moneyplant (Pothos sp.) does not seem to know that. Its been in the bowl for the last one year and still stays small with small leaves. Gets new leaves about once a month. OTOH, the parent, the one that I got the cutting from (actually stole - apparently you should only steal moneyplant cuttings - its supposed to be bad luck if you get it legally ) is planted in soil and has leaves the size of dinner plates. Its wrapped around a tree and has grown enormous. They only get large if potted in soil. Water culture stunts their growth. Its absolutely OK to keep it in a betta tank although I would personally not like the aesthetics. As Deepesh mentioned, it is proabbly planaria. They are not dangerous to your fish but indicate high organic content in the water. Do not add any medicines if your fish is not ill.
Do regular 50% water changes with aged water at the same temperature - once in 2/3 days. Over the next 2 weeks they should disappear. Your money plant will not suffer. If it does, you can always pull it out and put it in fresh water till the tank is clean of "worms"
Add an airstone for aeration by all means but keep it hanging near the surface and keep the bubbling to a low rate. hey i added salt for 1week i can see almost 90% worms gone and yes i do 50%wc twice in 1 week and i am adding salt when i do wc but you mentioned that do wc woth aging water is it fine if the water is 1-2months old or its better to add tap water with dechlorinator??? and 1 more question my white gravel is turning a bit yellowish may i know the reason why?? OK seriously speaking water thats a month or two old is great - as long as its not been in a cement tank. Over such a long time I suspect even old cement tank will make the water hard. If your water supply is only chlorinated then a simple dechlorinator added to the tap water is enough. For water supply that has been disinfected with chloramines you need to keep the water for some time - more than a week. Even then there is no sure way of removing chloramines. White gravel turns yellow - thats a fact of life for aquarists. Actually the gravel is covered with thousands of bacteria and algae (yes they are there no matter how clean your tank looks). They turn the gravel yellow over time. In my parents tank it turns a horrible dark green and then black in the light exposed areas! White gravel is usually a form of calcium carbonate. It will make the water hard. Bettas will do better in neutral or soft water. The plastic storage tank is good. When my mother wants to clean the gravel she boils it. I dont recommend that but it makes no difference to her. "I understand what you are saying" is what she says and then boils it the next time she feels like cleaning it. At least thats how things were till about a year back. I have stopped asking about that tank now. Nobody in the experts house listens to him. Don't boil your gravel. Change it. Gravel for a betta tank will not be too costly. If you are not planning on planting it just get some quartz gravel. Very inert and safe and cheap! A kg will cost less than a McDonalds burger. Its is very effective for growing artificial plants. My wife grows her silk plants in a rather red quartz. but i didn't get (Its is very effective for growing artificial plants)??? and i wanted to tell i have a white color chip gravel does that also contains calcium and what is quartz gravel any pic or something??? and what will i do with this current gravel??? Any white opaque gravel is suspected calcium carbonate. Some of these rocks are very hard and will not immediately react with acids so they may not seem like carbonates. Quartz comes in many colors so its difficult to point out a color and say this is what quartz looks like. What quartz looks like is construction sand - the one they use for making buildings. Thats actually river sand so it has a lot of other mineral rocks in it. But if you look closer you will see that the majority of the grains are brownish yellow translucent bits of glass like mineral. Thats quartz. There is white quartz but its a more translucent milky white than the white gravels you see in LFS and often contains traces of minerals of different colors. I havent seen any available as aquarium gravel. http://en.wikipedia.org/wiki/Quartz is a link to the wikipedia page on quartz and halfway down the page is a great photo of milky white quartz. Quartz is useless as far as growing real plants is concerned. About as nutritious for the plants as a bare bottom tank. Of course artificial plants dont grow. I was only kidding at my wife's expense.